Prezens, the ECM CD, was released a little under a year ago, although originally recorded March 2005. I think this is their first performance in the UK as Prezens (is that the group name or the record?) although this is essentially Berne’s Hard Cell group, with the addition of (and leadership transfer to) David Torn. Torn, I suppose, is supposed to be a sort of background genius, but it’s only through Berne’s association that I’ve ever heard him (he previously performed with Science Friction—Hard Cell + Marc Ducret (or is that Big Satan + Craig Taborn? )—at the London Jazz Festival, I remember)… The thing about Prezens, the disc (which is brilliant and fresh) is that it seems so dense with editing and post-performance processing (in a Teo Macero cut-up and splice sense), that it’s hard to tell what’s live and what’s ‘artificial’. In fact, Prezens the live act seems pretty well removed from Prezens the record, with no obvious tunes/themes, just a continuously evolving improvisation (presumably based on something? It would be interesting to know how it’s all set up!). 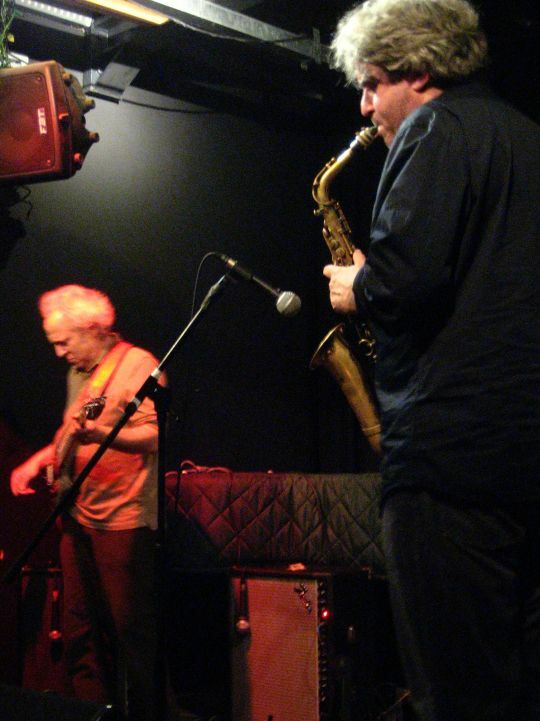 When I’ve seen Tim Berne in his own groups (Big Satan, Paraphrase) it’s all continuous weaving streams of invention, but they always seem to have some definite theme in their heads (playing around, playing towards, playing away from). This Prezens seemed to be much less pre-determined, and a little bit more dangerous; as the maelstrom revolved around the stage, it might have taken a bit longer for everyone to come down on something brilliant, a bit more of a struggle to tame everything, but the experience was quite fantastic for it. A great first-gig start to 2008; the opening night of the Bohman Brothers’ New Year New Sounds Festival at the Battersea Arts Centre… This runs until Saturday, but I’m not sure I’ll be able to make it back there this week; the BAC site has a full programme listing.